If you are installing custom cabinets in your home, or if you are looking for a way to upgrade the appearance of the cabinets that are currently installed in your home, then you should consider the option to add custom lighting to your cabinets. Lights can add a unique touch of elegance to the design, and they also improve the functionality of the cabinets at the same time. 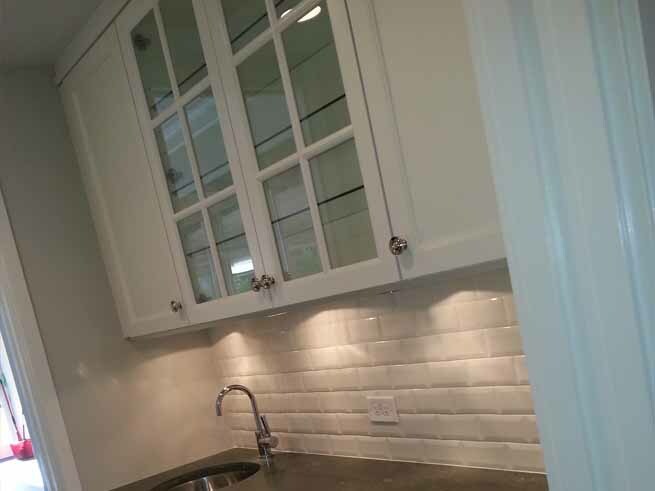 There are many ways that custom cabinet lighting can be used to improve the appearance of your cabinets, and once these lights are installed you will be able to enjoy the benefits every day. Some people like to have custom lights installed within glass cabinet doors, in order to highlight the items that are stored within the shelves and behind the glass. These lights can be installed in china cabinets, curio cases, built-in cabinets, china hutches, and any other type of display cabinets. They can be catered for any type of space, including anything from studio apartments to mansions, as well as work spaces such as kiosks, retail shops, museums, craft fairs, trade shows, and galleries. Another option for custom lighting is to include lights on the bottom of the cabinets so that the lights brighten up the counter space underneath the cabinets. Brightening up the countertops can give the appearance of more counter space, and it can also open up the room a little more. Here at Custom Cabinets Chicago, our goal is to help you combine functional lighting systems with elegant designs. We can help you turn practical applications into beautiful design elements, so that you don't have to sacrifice style for functionality. Cabinet lighting allows you highlight the book collections, art pieces, collectibles, and valuables that are being stored in your cabinets. These lights also help you to clearly see the items that are inside closed doors, so that you can quickly grab the item that you are searching for. Lights in your cabinets will help those cabinets to come alive, and you can design the lighting layout to match your preferences. It is amazing to see how much a little bit of light can completely transform your cabinets. In-cabinet lights get rid of the shadows, and they accent the rest of the room at the same time. What Types of Lights Do You Need? We offer a variety of lighting styles to make sure the lights match your preferences and look good on your cabinets. LED lights are growing in popularity because they don't produce much heat and they keep the cabinets well lit at the same time. Previously, fluorescent and micro-fluorescent lights were often used, but these options weren't very energy efficient and they can impact certain types of wood because of the heat that is produced from the bulb. LED lights waste less energy, they are cheaper to run, and they look great. Another benefit of LED lights is that they are not hot to the touch, so you don't need to worry about children touching the bulb and burning their finger. Additionally, the cooler temperature is better to preserve the items that are stored within the cabinet. When you are choosing the type of lighting, consider whether the lights will be temporary or permanent, and the location where they are being installed. There are certain areas that look nice with recessed lighting that is built into the cabinet, whereas other locations might do better with surface mounted puck lights. You can also choose the way the lights are controlled. For example, some people prefer to have each individual light controlled by a single knob or switch, while other people prefer to have all of the cabinet lights connected with the same switch so that they can all be managed at the same time. Contact us today to learn more about the various lighting options that are available, and we will gladly help you install the perfect cabinet lights for your home or office.